Excitement at the Global Citizen Festival - SABC News - Breaking news, special reports, world, business, sport coverage of all South African current events. Africa's news leader. The concert line-up includes Beyonce, Casper Nyovest, WhizzKid and Usher. The Global Citizen Festival has kicked off at the FNB Stadium in Johannesburg. It will be broadcast on SABC 1 TV channel, the SABC Digital YouTube channel, Facebook and Twitter – as well as on radio stations, 5FM and Lesedi FM. 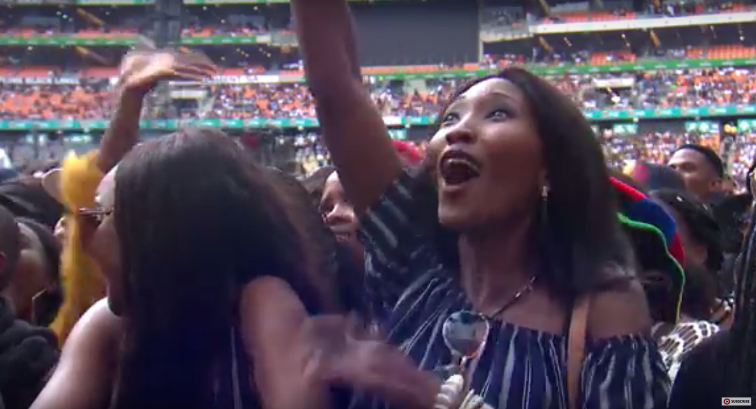 There’s excitement in the air at the FNB Stadium as fans enjoy the Global Citizen Festival which has started on Sunday afternoon. People started arriving earlier and gates opened at 11 o’clock. The concert line-up includes Beyonce, Casper Nyovest, WhizzKid and Usher. It honours the centenary of Nelson Mandela and aims to end extreme poverty by 2030. The campaign generated a whopping 15-billion-rand in pledges, which will be administered through the UN or local initiatives. The event is being hosted by Trevor Noah and one of the acts was US Grammy-winning artist Usher. “So early, so happy, so alright. I’m expecting to have fun, hopefully, see a lot of surprises that are not on the lineup, to have fun, the keynote speakers, just to be inspired. We’ve arrived at the global citizen fest, I’m sooo excited, yes!” what fans had to say ahead of the event. This entry was posted on 02 Dec 2018,03:03PM at 3:03 PM and is filed under Lifestyle, News, Homepage Featured Story Slider. You can follow any responses to this entry through the RSS 2.0 feed. Both comments and pings are currently closed.